Moschino has launched Moschino Toy, the brand's latest fragrance. 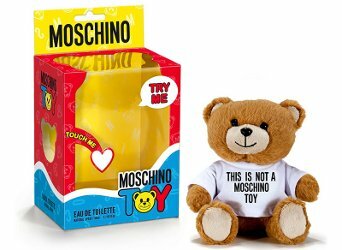 Moschino Toy is a unisex scent, and comes housed in a teddy bear. I will update with notes when I can. Moschino Toy is available in 50 ml Eau de Toilette, $110, and can be purchased now on the Moschino website. Update: the description via UK Vogue..."What it finally became is a blend of mandarin, cardamom, and bergamot with a heart of lavender, violet petals and hawthorn and a drydown of sandalwood, vanilla, moss and acacia." That dress is so contrived. Blech. Slight April 1st vibe :). Ha, yes…especially since they did not even bother to describe the actual fragrance! I have mixed feelings about hiding a perfume bottle inside of a plush toy. You have to decapitate that bear to get to the perfume sprayer, no? But it’s fun, and I’m sure that’s what they’re after. that comment was supposed to be at bottom of comments. but +1 on bear glass. Avon did a teddy-hear-shaped bottle years and years ago for I think Sweet Honesty. The glass was flocked in tan! And yeah, you had to twist the bear’s head off to get to the sprayer. I can put some juice in my own stuffy, put some juice I already own in it and save $110 bux. I won’t do that though. lol. Ok. I’m gonna go against the mood and say I kinda LOVE that ad! The pink on pink and the ridiculous bear outfit makes me feel like I’m in pop art or a wonderful, mod runway show. Side note: Am I the only one thinking the placement of the Teddy’s head is deliberate..? It’s reminding me of that terrible Miley Cyrus video.